On November 1, 2016, the Central Oregon Forest Stewardship Foundation, with support from the Oregon Department of Forestry’s Federal Forest Restoration Program, The Nature Conservancy, and other regional partners, hosted a multi-day workshop to facilitate peer-to-peer learning among land managers, forest restoration industry and contractors, and collaborative stakeholders. Participants engaged in high-level, technical discussion on topics surrounding the challenges and opportunities of applying innovative forest restoration implementation efficiencies and effective strategies to successfully increase the quality, pace and scale of dry forest restoration treatments. Working alongside the planning committee, I designed and built a WordPress platform website for interested participants, which included discussion topics, speaker bios, workshop schedule, lodging information and online registration through Eventbrite. Since many of our partner organizations possessed extensive email distribution lists, I also created a series of branded email banners with registration calls-to-action and a one-page fact sheet for both printing and digital dispersal. 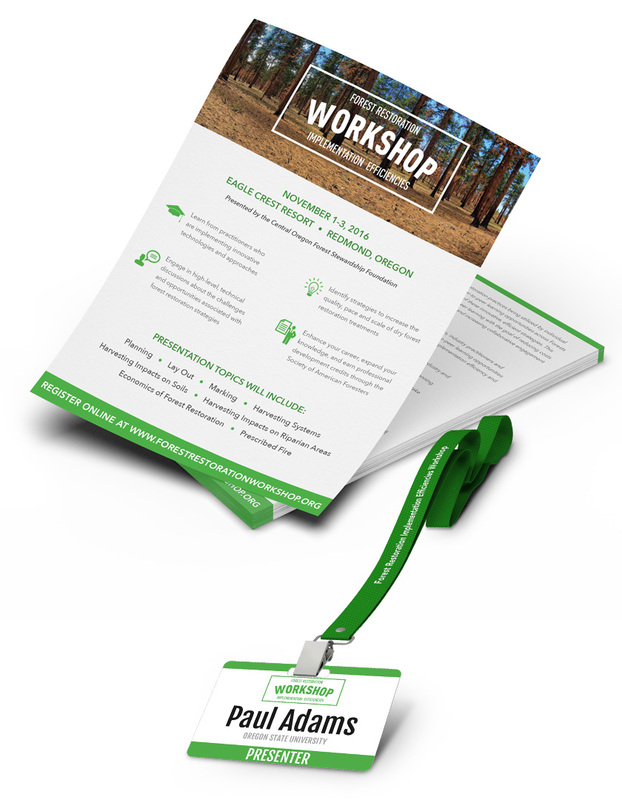 For the week of the workshop, facilitation extended beyond on-the-ground logistics to also include the graphic design and printing of a workshop agenda, name badges, table tents, directional signs, handouts, and surveys. Continuity is key with visual branding and I carried the same look and feel of the website into all accompanying printed collateral. Following the completion of the workshop, part of my deliverables included shifting the focus of the Workshop website from online registration to information portal. The website now hosts a centralized Resource Database, which was compiled to provide educational tools, slide decks, photos, links and further information for both participants and other industry professionals.